Norman Hilton was the best of this bunch. You should get a photo to add. Or I could send you one. Ahh, yes! These classic, iconic logos are on the inside of the garment, where I believe they should be. Loving this post! Thanks. I wore a Norman Hilton tweed last Fall on Prince Edward Island, Nova Scotia, and could not have been more " toasty". I only wish I could wear a tweed today. The local Aggie " Weather Guesser" said to expect 98F today in Texas. Love seeing that old Brooks label. I still have a few from the mod to late '80s but they no longer fit. Prince Edward Island is a province, it is not in Nova Scotia. So admire the craftsmanship/artistry of handloom woven tweeds. 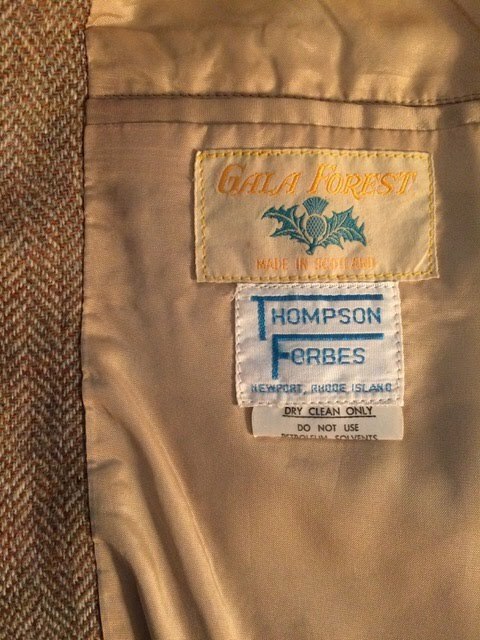 As a child I asked about the Harris tweed label; my Dad explained where the 'outer Hebrides' were and how his jacket was made. A fan ever since & always look for 'handloom' on tweeds & plaids. From Conde Nast's Traveler, March 2017: "Tweed-making on Harris is a meticulous, slightly controlled process. A finishing house gets bales of wool from contracted suppliers, then spins it and dyes it. That yarn is passed on to a weaver, typically an older man who works a loom in a shed next to his home, along with a ticket specifying a pattern. A few days later, after pedaling the yarn through his loom and tying about 1,600 knots, he's produced a 50-yard bolt of fabric."